My discovery of cornmeal from Cayuga Pure Organics, the same outfit that supplies dried beans to our neighborhood organic food market, has opened new doors for the Dark Days. Since corn can readily be grown here and in many other parts of the country that don’t support other grains like wheat, grist mills used to dot many local landscapes. It will be interesting to see what happens with the resurgent interest in growing and processing grains locally. I’m thinking about growing some corn myself next season, but obviously not in my shady in-town yard. Alternatively, since I may take a road trip to western New York in the fall, maybe I can visit Cayuga and stock up. For this meal, instead of making plain polenta from cornmeal and water, I used an Italian method of cooking the cornmeal in milk and pureed pumpkin, which I read about in Sylvia Thompson’s Kitchen Garden Cookbook, the companion volume to a gardening book that I am consulting while I plan my own kitchen garden. Planting will start in a couple of weeks! This couldn’t be simpler to make, but you do have to plan for the two-hour baking time. 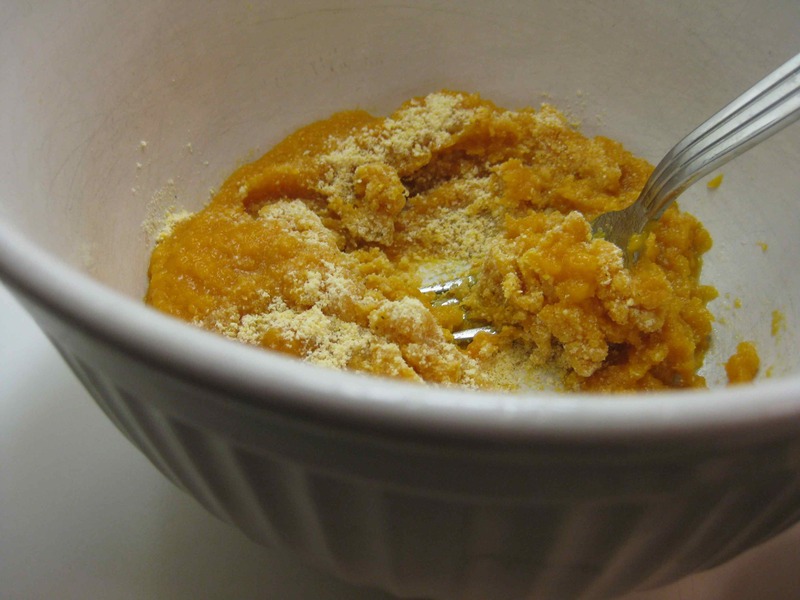 Basically, you stir cornmeal into pureed pumpkin, add milk and spoon the mixture into a baking dish. Sprinkle with onions sautéed in a little olive oil and bake it in a slow oven. You can add grated cheese on top at the end, or not. I was pleased to use up some of the large volume of pumpkins and squash that I still have from the fall, and I found a volume of fresh greens at a Slow Food winter indoor farmers’ market. A local organic farmer has been growing kale and other greens in an unheated hoop-house all winter, with great success. As we heard at the winter conference of the Northeast Organic Farmers Association, this is an increasingly popular way of growing and farmers are lining up to apply for aid to serve local communities. I’m all for that. Preheat the oven to 300 degrees. 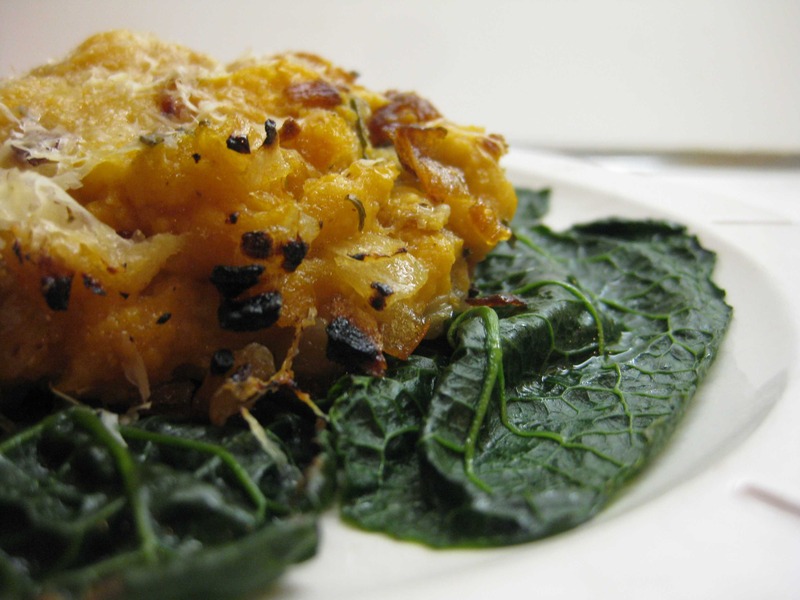 Combine the pumpkin puree, cornmeal and salt. 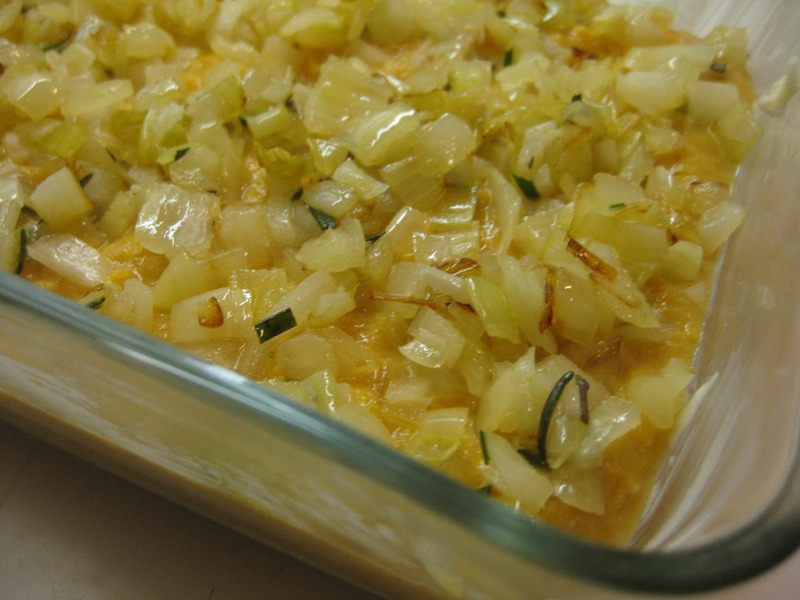 Gradually add the milk and spoon the mixture into a buttered or oiled baking dish (with 4-6 cups capacity). Cook the onion slowly in the olive oil until translucent, adding the rosemary toward the end. Spoon over the pumpkin-cornmeal mixture. Bake for 2 hours until golden brown. 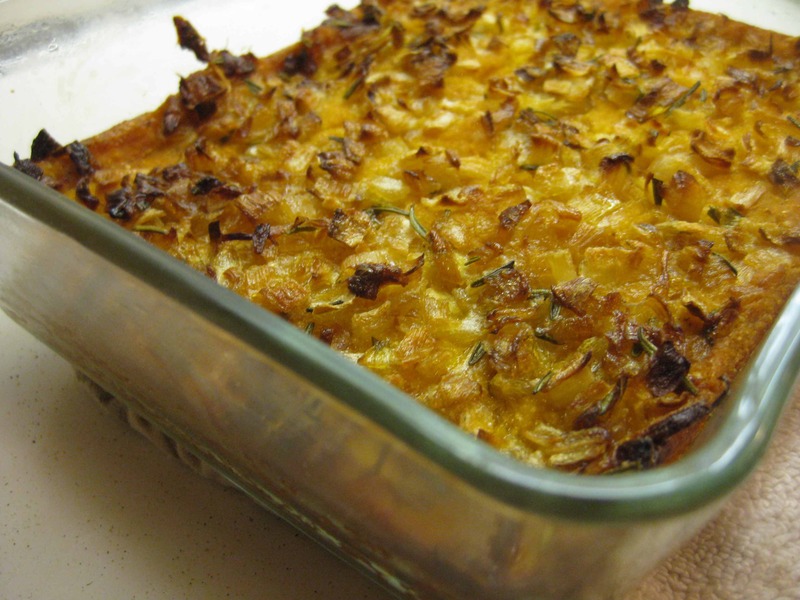 Remove from the oven and top with the grated cheese. Serve immediately (best) or refrigerate and reheat in the oven.